Rajapack has a huge range of palletising equipment from stretch film wrap and shrink wrap, to strapping and pallet accessories to help protect and secure loads. 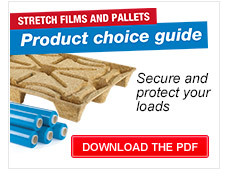 Stretch wrap is perfect for securing pallets and wrapping awkwardly shaped products ready for delivery, whilst our wood and plastic pallets create a solid base. Rajapack also stock a range of palletising and stretch film wrap machines to help save time and make your warehouse more productive. Our in-house packaging experts will help find the best products for your business so you can get everything you need, delivered the next day.